In this April 17, 2017, photo released by U.S. Marine Corps, an AH-1Z Viper prepares to land at the Chocolate Mountain Aerial Gunnery Range, Calif. A statement from the Marine Corps Air Station posted on Facebook Saturday, March 31, 2019, says two pilots have died on an AH-1Z Viper helicopter crash, while conducting a routine training mission near Yuma, Ariz. The accident occurred at about 8:45 p.m. Saturday. YUMA, Ariz. (AP) — The names of two Marine pilots who died in a helicopter crash during a training mission in southwestern Arizona were released Monday as the crash remained under investigation. U.S. Marine Corps officials identified the dead pilots as Maj. Matthew M. Wiegand, 34, of Ambler, Pennsylvania, and Capt. Travis W. Brannon, 30, of Nashville, Tennessee. They said the AH-1Z Viper crashed about 8:45 p.m. Saturday on the vast Marine Corps Air Station Yuma training grounds while the pilots were conducting a training mission as part of a weapons and tactical instructor course. 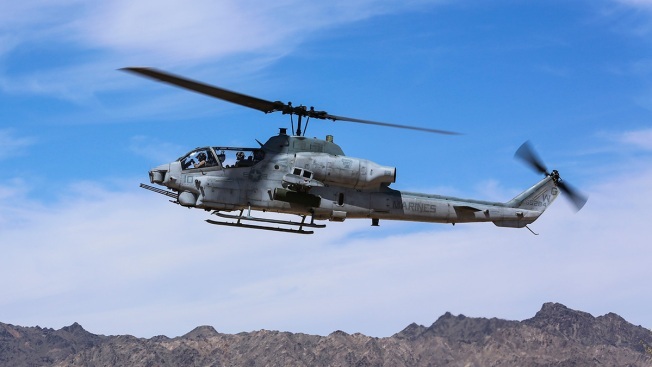 Officials said Wiegand held qualifications in the AH-1Z Viper and AH-1W Super Cobra and Brannon was attending the semi-annual weapons and tactics instructor course hosted by the Yuma base. "It is a somber day for the entire Marine Air Ground Task Force Training Command as we mourn this tremendous loss," Brig. Gen. Roger B. Turner Jr., a commanding general at the base in Twentynine Palms, California. Arizona Gov. Doug Ducey ordered flags to be lowered to half-staff Tuesday. Wiegand, who joined the Marines in 2008, was assigned to the Marine Aviation Weapons and Tactics Squadron One in Yuma. His previous duty stations included the Naval Air Station in Pensacola, Florida; the Marine Corps Base Camp in Pendleton, California, and the Marine Corps Air Station in Yuma. Marine officials said Wiegand previously deployed in support of a Unit Deployment Program in Okinawa, Japan, and his personal decorations included the Navy and Marine Corps Achievement Medal with a gold star. Brannon was assigned to the Marine Light Attack Helicopter Squadron 367, Marine Aircraft Group 24, 1st Marine Aircraft Wing, in Kaneohe Bay, Hawaii. His previous duty stations included the Naval Air Station in Pensacola, the Marine Corps Base Camp in Pendleton, and the Marine Corps Air Station in Kaneohe Bay. Brannon also participated in Marine Rotational Force Darwin in Northern Territory, Australia, and his personal decorations included the Global War on Terrorism Service Medal and Sea Service Deployment Ribbon. The names of two Marine pilots who died in a helicopter crash during a training mission in southwestern Arizona were released Monday as the crash remained under investigation.